If there’s anything that can be called the silver bullet in getting people to take action then this is it! 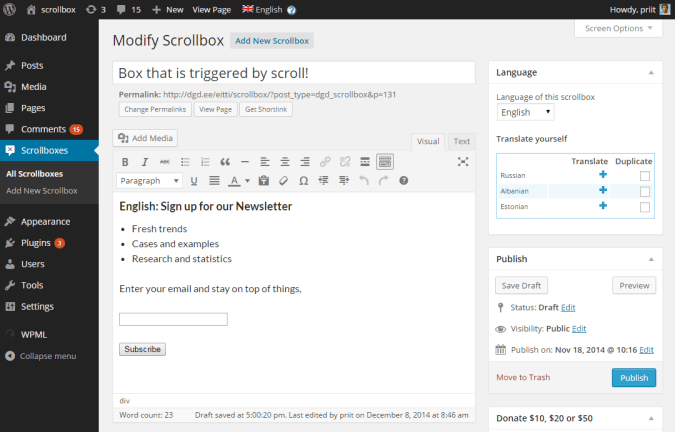 The scroll triggered box has consistently increased conversions rate by several times. All new version 2.3 available! Or something completely unique to your marketing strategy. Scroll triggered box will draw attention after people have engaged with your website. Reaching an end of the post or comments. These events help you verify that visitors are engaged with the content. Presenting a call-to-action to engaged visitors will drastically improve your results. 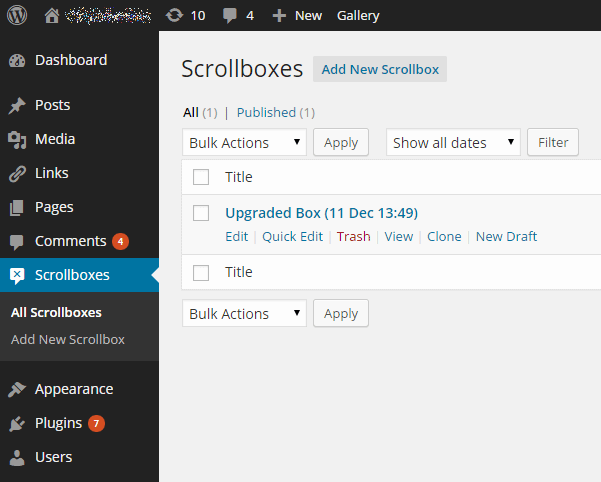 Download from WordPress site: Dreamgrow Scroll Triggered Box. Hey there, great plugin, though it seems to clash a bit with the Divi Theme’s editor. When the plugin is activated and you try to change, say, font size with the editor, you can no longer write a number to indicate a new font size, and the number no longer updates when you drag the scrollbar to vary size. This is a great plugin, the only thing missing is the ability to hide for logged-in users. Do you have any plans for this ? What does this do on mobile? Will it work the same way or just not appear? What is a good mobile solution for this same feature? We have an option to show or not on mobile. How do i change the background opacity when the popup appears? If you don’t set a theme (none) then it’s transparent. You can use PNG images for background for various levels of transparency. This way you can even create round popups. 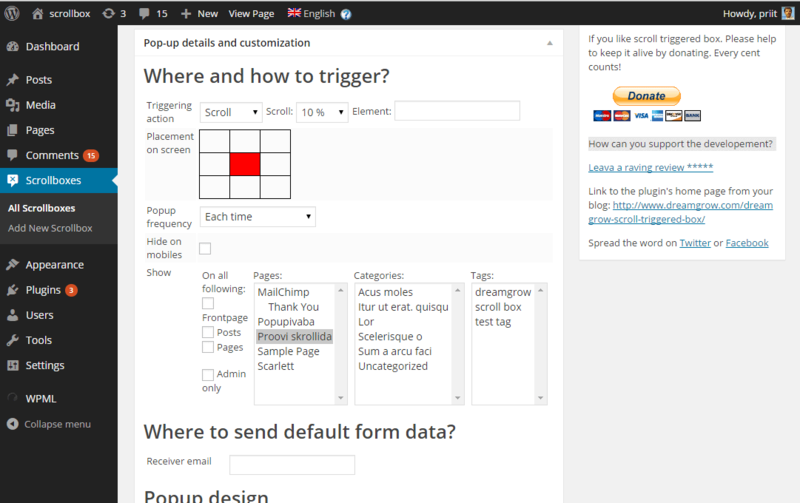 I’m using this plugin right now in my site. So far so good! Thanks for making this plugin better. How do I add a Captcha function to my scroll trigger. Other than that, it’s working well! Brilliant! A nice plugin that appears very easy to set up. Let’s give it a try! The box use to work – not it doesn’t. Very sad. Please help! THX! I like your plugin a lot : ) But can you please tell me why the Facebook button is not showing up? I have it selected to appear along with the other buttons. 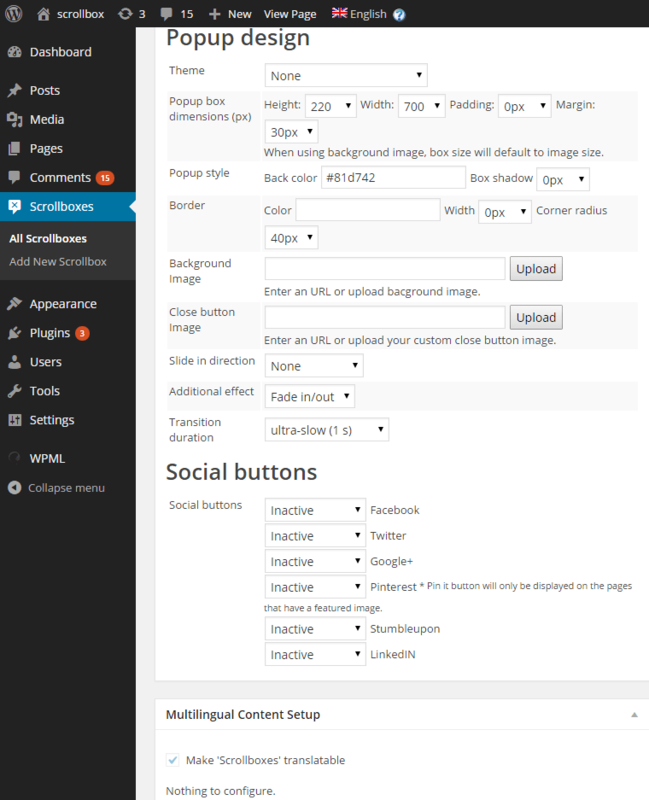 Also, I have WordPress version 3.4.2. Thank you. Your plugin works really fantastic thank you so much for your hard work providing it. Is it possible to make several different “Scroll Boxes” that will be different depending on the page? No unfortunately. You can have only one at the moment. I have the same question as Jennifer and and Zach .. the plugin is great, but once they send their email, where does the email go????? Please respond ASAP – i see the this is the third time this question has been posted and not answered. Make sure you install version 1.1 of the plugin. Then using the default form sends signups to the admin email address of you WordPress installation. kind of a noobish question: Once they typed their email and clicked subscribe, where does their info get sent to? Also, can this work with AWeber? Hi, I really like your plug in but does it store the email addresses anywhere on my site? The box pops up and looks great, but what now? Will it notify my subscribers? Sorry I couldn’t find any further docs. Thanks! Your plugin looks just what I’m looking for, however, I am having problems getting it to work. I have installed it all ok, and gone into the admin section but I’m not getting the option to select a theme. There is a dropdown box but no options in it. I see from your screenshots it says “Default”. Would it work if I add Default into one of the database tables using phpmyadmin? Sorry! We had made a mistake in coding and it pointed the templates into wrong location. We fixed it in version 1.0.1. Simply updating your plugin should work, but if it doesn’t then delete the plugin and reinstall. Thank you for feedback!